They say it’s not what you know, but who. In the case of Bluegame, it’s a bit of both. 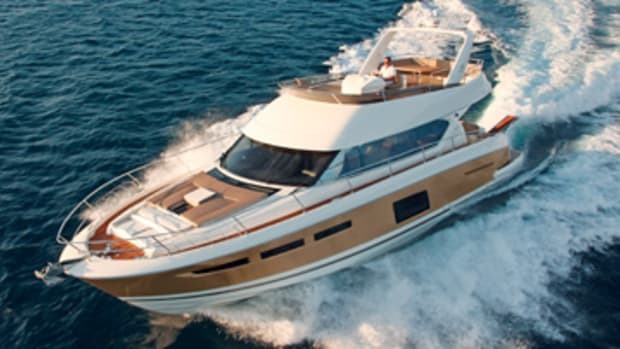 The name may be new to most stateside owners, with the first 60 not due to appear until the Fort Lauderdale International Boat Show show in October. But this new Italian brand has an excellent pedigree and powerful friends. 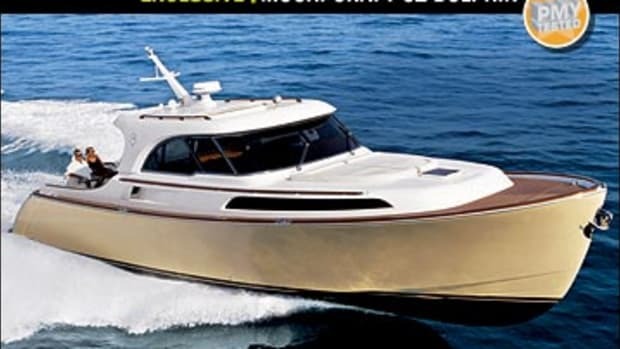 The pedigree is unassailable: Lou Codega drew the hull lines, MAN supplies the motive power (though it was MTU on this prototype), and the layouts both above and below decks were designed by a yachtsman of international standing. 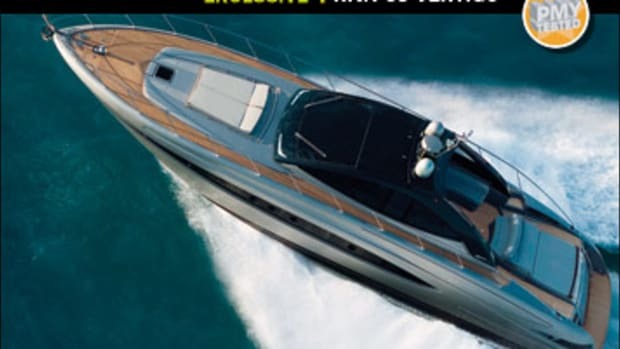 As for the aforementioned powerful friends, Bluegame builds its boats in Ameglia, Italy, home to the superyacht builder Sanlorenzo, and thanks to a fortuitous family connection, it’s Sanlorenzo that takes care of the marketing. The man behind Bluegame is Luca Santella, a yacht captain and Olympic dinghy sailor who represented Italy in the 1988 and 1992 Olympic Games. 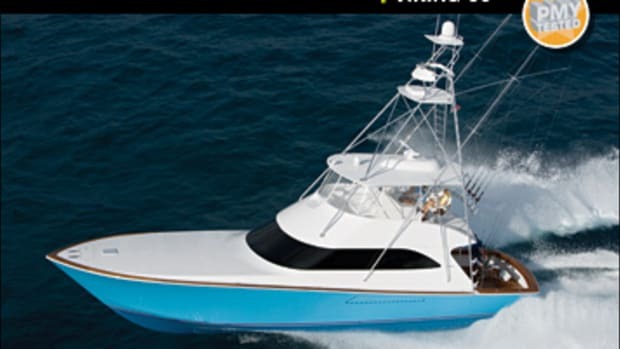 He was working in South Africa in 2004 when an owner asked him to come up with a walkaround-style boat on a sportfishing hull. 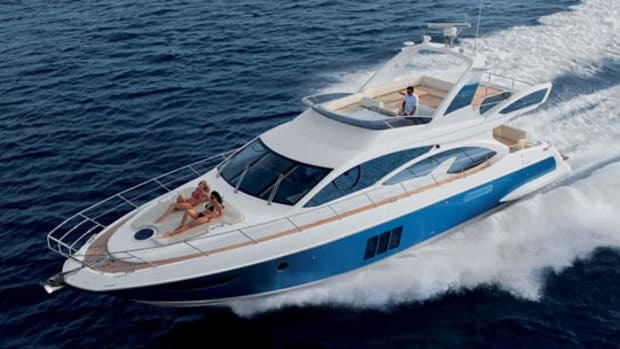 The result was the Bluegame 47, built and launched in Cape Town in April 2005. Then Santella’s older brother, Antonio (another Olympic yachtsman), introduced him to Max Perotti, boss and new owner of the Sanlorenzo shipyard where Antonio is a director. One look at the Bluegame 60 and you can see how the concept appealed to Perotti, whose Sanlorenzo shipyards build full-spec custom and semicustom motoryachts up to 145 feet. The Bluegame range is also about choice. Not just hull color, although there are plenty of those, but the whole concept of the boat can be customized according to your needs, with five versions available, depending on the options you go for. Basically, though, in all versions, the Bluegame 60 is a big, sporty walkaround. The deck spaces are broad and deep, and the central section is raised well above the main deck, with the helm area amidships, commanding a great view all around. There is a convertible dinette just aft, big enough to seat five or six, and an upholstered sunbathing or seating area, with its own table, behind that. Down on deck, high bulwarks make getting around the boat safe and secure. That little sofa that’s cut into the coachroof up front is a great place to sit, as is the foredeck sunpad, even underway. 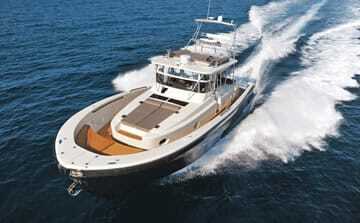 There is also a big, open platform aft with space for a tender. Down below it gets interesting. Even getting below decks is more interesting than perhaps it should be, thanks to the vertiginous companionway, which could really do with some sensible handholds. In fact it’s so steep that a vertical pole would probably do the job, without getting in the way too much. Once down there you find yourself in a small saloon, with a long, straight, and practical-looking galley on the port side and an L-shape sofa, with a small, built-in desk, to starboard. There’s nowhere to eat down here, which means carrying meals back up those stairs, although with the cooktop, fridge, ice maker, and stowage lockers, the cooking and drinks facilities up on deck are pretty capable. Forward lies a guest cabin with a pair of single berths along the hull sides and a good-size head and shower that double as the day head. Venture aft and you’re in the master cabin, which has a nice, big double berth mounted athwartships and a head compartment which is small indeed. There is also a dressing table, and in common with the rest of the lower deck, lots of headroom—at least 6&apos;6" here and some 7&apos;0" in the forward cabin. Thanks to the lofty helm deck above, there is more vertical space in the saloon than I could easily measure. Large skylights help to capitalize on this feeling of spaciousness and flood the saloon with light without depriving it of an essentially traditional, cozy, below-decks feel. There is more to the 60’s interior style than this echo of traditional sailboat design. The layout is assembled from practical, unpretentious right angles and straight edges, and while the joinery is finished in a high-quality white lacquer —hey, it’s an Italian boat! —the craftsmen responsible have been careful to make sure the woodgrain is still there, if you look for it. The obvious seams between the panels are also quite deliberate in this clever evocation of “downeast” stylistic values. It does feel a bit like a sailing yacht down below, but it also looks a bit like a beach house. A sportfisherman she might be, but the Bluegame is much more Maine than Florida. There’s an old-world, elegant simplicity up top, too. Forget stainless steel biminis and electro-hydraulics. The sun awnings fore and aft need to be rigged by hand, but when they’re done they look great. And the carbon-fiber davit on the stern platform (see “Noteworthy” this story) might look like it was designed by Norman Foster, but in use it would be more familiar to a sailor from the USS Constitution than to the average superyacht deckhand. If the typical motoryacht of recent years has been aimed at the same market as those for high-end cars with ingenious folding cupholders, then the Bluegame seems designed to appeal to the type who wonders why the hell people drink coffee while they’re driving. The same sort of person, that is, who can tie a bowline without looking and for whom simplicity not only means reliability but is also a virtue in itself. But even died-in-the-wool salty types appreciate a good electro-hydraulic gangplank, and the 60 has got one of those. They also appreciate a solid machinery installation, and she’s got one of those, too. The engine room is reached via the small crew compartment in the stern, and although your engineer will have a job reaching all the main service points, particularly those outboard of the motors, the overall quality of the fit looked good. Underway, we were pretty well loaded for a test. It was the end of a long, hot day at the Monaco Yacht Show, and when I took a head count, there were 14 of us. We also had more than two-and-a-half tons of fuel and water aboard. 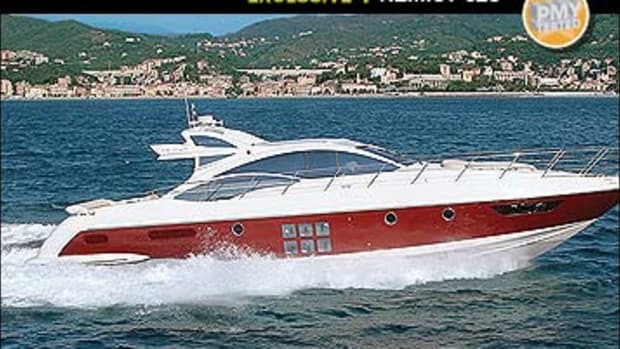 But with the 2,172 hp available (twin 1,086-hp MTU M92 V8 diesels), the Bluegame proved a lively performer, with a thoroughbred, deep-sectioned hull to iron out the chop—most of it, admittedly, of our own making on this balmy Mediterranean evening—and excellent handling characteristics. Like most old-style deep-Vs she rides quite bow-high, but that helps keep you dry, and visibility all around is so good it’s never likely to be a problem. If you don’t like the running angle, the trim tabs are very effective. 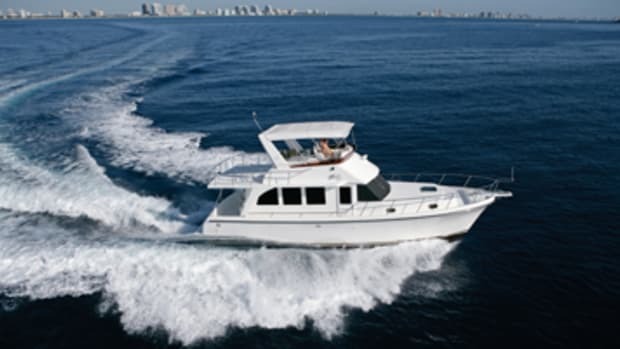 Powerfully geared steering complements the hull shape and produces tight, dramatic turns with lots of driver-friendly heel. In all, she’s a fun drive. And with no creaks or groans emanating from down below, the 60 feels solidly put together and confidence-inspiring. Luca Santella explained that the props on this prototype were a little too finely pitched, so the engines were over-revving a bit (2460 rpm at WOT). 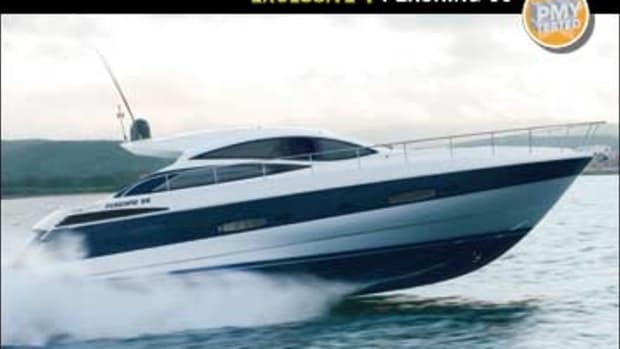 More to the point, he added that future boats would have slightly more powerful MAN V10s rather than the MTUs, and he reckoned on a top speed of 36 knots. Although at a shade under 34 knots, this Bluegame didn’t exactly seem sluggish. Luca likens his Bluegame concept to an automotive SUV—versatile, rugged, and powerful—and you can see his point. Even with the optional tuna tower, though, I doubt too many owners are going to get their teak decks spattered with fish blood. 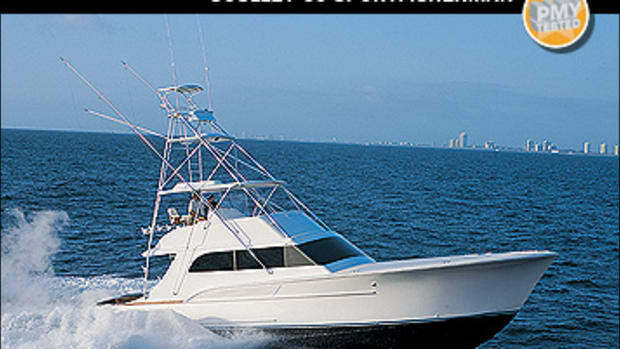 The 60 is less a sportfishing boat than a great and highly capable dayboat or weekender. If this is an SUV, it was built by Bentley. Let’s face it: tenders are big and heavy. A lot of effort goes into designing handling systems for them: there are hydraulic hoists, electric winches, stern garages, gantries, davits, and more. You name it, and it tends to get complicated. Bluegame has returned to first principles with its choice of a beautifully simple, sleek, British-made carbon-fiber Atlas davit. It weighs just 42 pounds and yet can handle up to 1,100 pounds of tender. It swings over to take up hardly any space on the stern platform, and it’s completely manual, utilizing a sailboat-style deck winch. With its reliable, seamanlike practicality, this unassuming yet very cool piece of kit is completely in keeping with the rugged Bluegame ethos.